On my way out to play a little golf. Been busy with chores and yard work this weekend. Spent a lot of time watching the PGA championship….Phil is in contention. I am a big fan and pulling for him. Also, if Phil can’t’ win it maybe Rick can. I will admit though…Rory is on fire. He is in the zone, focused, and he is expecting to win. If someone can make that move and beat him… It will be a victory for the ages! One more note. I watch the posture of a lot of the golfers…all I can say is they need FOUNDATION TRAINING! If Mr Tiger, who thinks he is a weight lifter…knew FT he may have avoided back surgery and would be still be playing…. FOUNDER ON THE GOLF COURSE! 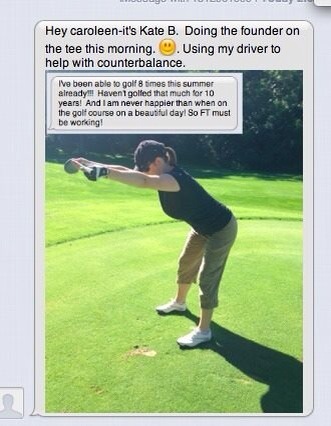 This entry was posted in Foundation Training, Uncategorized and tagged back pain, Foundation Training, golf, phil mickelson, posture. Bookmark the permalink.